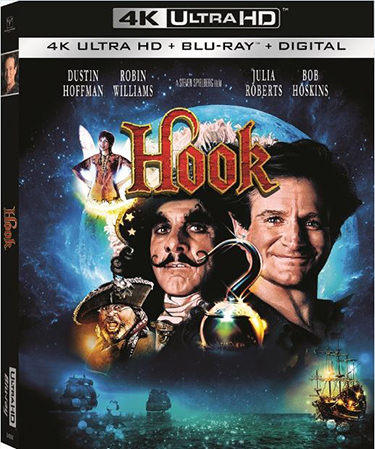 Just in time for the holiday season, take a trip back to Never Never Land with the beloved and timeless classic HOOK, debuting on 4K Ultra HD and on Digital in 4K with HDR October 9 from Sony Pictures Home Entertainment. Internationally-acclaimed director Steven Spielberg’s update on the legendary tale of Peter Pan features an iconic cast, including Dustin Hoffman as “Captain Hook,” Robin Williams as “Peter,” Julia Roberts as “Tinker Bell,” Bob Hoskins as “Smee” and Maggie Smith as “Wendy.” Nominated for five Academy Awards,* this enchanting tale follows an adult Peter Pan as he returns to Neverland to reclaim his youthful spirit in order to challenge his old enemy Captain Hook, who has kidnaped his children. 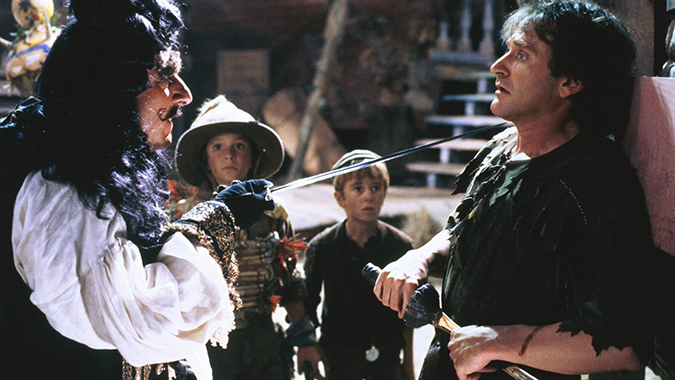 A high-flying adventure from the magic of Steven Spielberg, HOOK stars Robin Williams as a grown-up Peter Pan and Dustin Hoffman as the infamous Captain Hook. Joining the fun is Julia Roberts as Tinkerbell, Bob Hoskins as the pirate Smee, and Maggie Smith as Granny Wendy Darling, who must convince middle-aged lawyer Peter Banning that he was once the legendary Peter Pan. And so the adventure begins anew, with Peter off to Neverland to save his two children from Captain Hook. Along the way, he rediscovers the power of imagination, friendship, and of magic. A classic tale updated for children of all ages, HOOK was nominated for five Academy Awards including Best Visual Effects in 1991. Academy Award is the registered trademark and service mark of the Academy of Motion Picture Arts and Sciences.